The United States federal government is facing a midnight deadline for a government shutdown if the Senate is not able to pass a budget in time. Essentially, federal agencies would be largely shut down with the exception of essential departments, services and individuals. Services such as national security, post mail, air traffic control, medical emergency services, prisons, taxation, energy production and the military would be unaffected by a shutdown. The last government shutdown in 2013 under former President Barack Obama sent about 800,000 civil federal employees home out of a total of 2.1 million. The Office of Management and Budget’s Mick Mulvaney said Friday morning that national parks would stay open, but last shutdown, which lasted 13 days, saw parks and monuments close. Diplomatic services may be affected in regards to visa and passport processing, according to U.S. media. 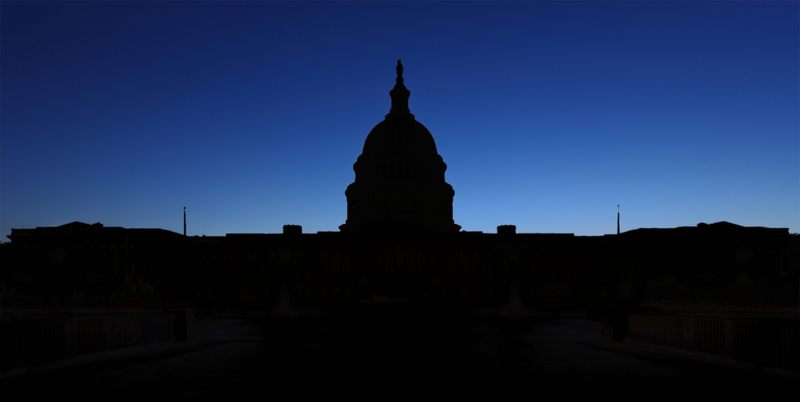 Image of the darkened Capitol Hill from Shutdown site.